View our modern platinum engagement rings here. If you are going to be proposing anytime soon then you need to start shopping for a gold or platinum engagement ring. Gold and platinum are two of the most popular choices when it comes to engagement rings. Gold has been the setting of choice for the past sixty years since platinum was banned during world war two and gold became very popular. In recent years, platinum has been making a comeback largely due to its beauty and star appeal. Hollywood stars often set the trends and it is no exception when it comes to engagement rings. People have seen movie stars sporting platinum engagement rings and have remembered the superior quality and beauty of platinum. Platinum is much harder than gold; therefore, it is sure to last a lifetime. This is important when it comes to lifelong decisions such as engagement and marriage. The longevity of platinum makes it an excellent symbol of lifelong commitment. Platinum has a white-silvery look to it which many people find attractive. Platinum is also more expensive than gold which is appealing to those who like it for a status symbol. You need to take everything into consideration to find the perfect ring for her. It is important for your partner to feel proud to wear it for the rest of his or her life. Do not forget that you can find matching wedding bands in platinum so keep an eye out for any platinum sets that might catch your fancy. If you want to impress your partner then browse through our online selection of platinum rings. You can even build your own platinum engagement ring by choosing your own setting style and your own unique diamond from our database of over 30000 stones. It is a perfect way to personalize your proposal even more. 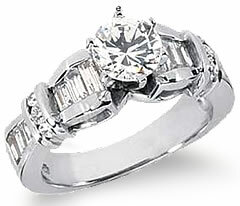 Check out our selection of modern platinum engagement rings. All of our jewelry is of the highest quality and is backed by a lifetime guarantee.